Well done to all students who performed at Cabot Circus promo day last Saturday 14th May. You all looked fabulous in your sassy Burlesque posing entire and cheeky Charleston flapper dresses. Please visit The Showgirl Academy Fan page for pictures and videos! The Flaming Feathers Cause A Stir! 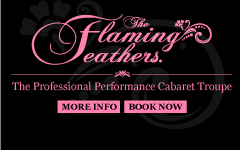 The Flaming Feathers appeared at Coco Boudoir in Bath on Saturday 23rd April finishing the show on a screaming high (literally) with their rendition of the french can-can! Full of humour, screaming, plenty of knicker flashing and very very high kicks The Feathers enjoyed being part of such a fab show!